Hasselbeck is the son of Mary Beth "Betsy" (Rueve) and Don Hasselbeck, a former New England Patriots tight end. He was born in Boulder, Colorado, where his father played college football for Colorado. Matt and younger brothers Tim and Nathanael grew up in Norfolk, Massachusetts, and attended Xaverian Brothers High School in Westwood. He was selected as an honorable mention All-American by USA Today as a high school senior. Matt Hasselbeck attended Boston College near his family's hometown. He played for the Boston College Eagles football team from 1994 through 1997, including two years with his younger brother Tim. Hasselbeck finished his college career as the starting quarterback (a position his brother Tim would later hold with the Eagles). He graduated with a degree in marketing. Hasselbeck was selected by the Green Bay Packers in the sixth round (187th overall) of the 1998 NFL Draft. He joined the team's practice squad in 1998 and acted as a backup for the starting quarterback Brett Favre. Hasselbeck joined former head coach Mike Holmgren and the Seattle Seahawks on March 2, 2001. The Packers traded him, along with their first draft pick (17th overall), to the Seahawks for their first (10th overall) and third-round draft picks (72nd overall). In his early years in Seattle he battled for playing time with Trent Dilfer. However, after a strong finish in 2002, Hasselbeck entered 2003 as the unquestioned starter. Hasselbeck started all 16 games, leading Seattle to a 10–6 record for the first time since 1988 and a wildcard berth. He also was selected to the Pro Bowl. The 2003 NFC Wild Card Game against the Green Bay Packers went into overtime where, at the overtime coin toss, Hasselbeck famously said "We want the ball and we're gonna score." During the second overtime possession for the Seahawks, Hasselbeck threw an interception to Packers defensive back Al Harris which was returned 52 yards down the sideline for a touchdown. It gave Green Bay a 33–27 overtime victory. In 2004, Hasselbeck won the 2004 NFL Quarterback Challenge. He also led Seattle to their first NFC West title since realignment in 2002. In 2005, Hasselbeck had one of his most productive career performances, earning the highest passer rating in the NFC, and leading the Seahawks to the playoffs for the third consecutive year while clinching the NFC's top seed. He led the Seahawks to Super Bowl XL, in which they lost to the Pittsburgh Steelers, and was the starting quarterback for the NFC in the 2006 Pro Bowl. During this season linebacker Lofa Tatupu joined the Seahawks. Lofa's father Mosi had been a teammate of Hasselbeck's father Don during his time with the Patriots. Hasselbeck led the Seahawks to a 4–1 record to start the 2006 season before being seriously injured on Week 7. Minnesota linebacker E. J. Henderson rolled into Hasselbeck's right leg. The result was a second degree MCL sprain, causing Hasselbeck to miss four games. Hasselbeck contended that Henderson could have avoided injuring him. Upon returning he subsequently broke fingers on his non-throwing hand, but continued to lead his team to a 9–7 record and the divisional round of the post-season. The fourth-seeded Seahawks defeated the Dallas Cowboys 21–20 in the wild card round in Seattle, then lost to the top-seeded Chicago Bears in overtime, 27–24. Hasselbeck passing against the Chicago Bears in November 2007. In 2007, Hasselbeck led his team to its fourth consecutive division title and fifth consecutive playoff appearance. He had 3,966 passing yards, 28 touchdowns (both career highs), 62.6% completion percentage, and a 91.4 passer rating. He threw for 229 yards in a 35–14 NFC wild card victory over the Washington Redskins. The third-seeded Seahawks lost in the divisional round to the NFC's No. 2 seed Green Bay, losing 42–20 in the snow at Lambeau Field despite an early 14–0 lead. Hasselbeck set career highs in yards, attempts, and touchdown passes in the 2007 season and was elected to his third Pro Bowl. In 2008, Hasselbeck suffered from a back injury that affected a nerve in his lower back, creating a weakness in his leg that brought on a knee injury. Hasselbeck twisted his back awkwardly in the preseason opener on August 8 at Minnesota and missed the rest of the preseason. His bulging disk was diagnosed and treated with injections and he opened the regular season as the starter, but he hurt his knee after a hit early in the Seahawks' loss to the New York Giants on October 5. He also received a helmet-to-helmet hit vs. the Arizona Cardinals. These injuries caused Hasselbeck to miss most of the 2008 NFL season. In the 2009 season opener, things did not start out well for Hasselbeck, who threw two interceptions in the first quarter. After that Hasselbeck dominated the rest of the way, completing 25 of 36 passes for 279 yards and three touchdowns in their 28–0 win over the St. Louis Rams. During Week 2 of the 2009 NFL season, Hasselbeck fractured his rib against the San Francisco 49ers and missed the next two games against the Bears (Week 3) and the Colts (Week 4). 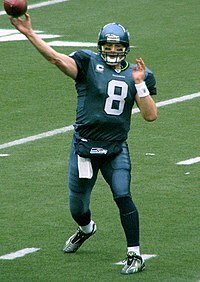 During Week 5, playing the Jaguars, Hasselbeck threw four touchdown passes in the Seahawks' second shutout of the season, beating Jacksonville 41–0. In Week 6, Hasselbeck played his career worst, losing to the Arizona Cardinals with 27–3. During the final week of the season, Hasselbeck won the Seahawks' "Steve Largent Award." In 2010, the season started off strong for Hasselbeck, leading his team to a 4–2 record and victories over the Chicago Bears and San Diego Chargers. But the degree of Hasselbeck's health would prove to be inconsistent, with injuries leading him to sit out crucial games later in the season, leading the Seahawks to lose seven of their last ten. Nevertheless, Seattle would make the playoffs with their fifth NFC West division championship. Hasselbeck was 45-19 at Seattle's Qwest Field. Seattle became the first team with a losing record to host a playoff game, taking on the defending Super Bowl champion New Orleans Saints during wild card weekend. Despite being 11 point underdogs, Hasselbeck had one of the most memorable and clutch performances of his career. He threw for 272 yards, four touchdowns (a franchise postseason record) with one interception coming from a tipped ball, and a 113.03 passer rating, leading the Seahawks to victory over the defending Super Bowl Champion New Orleans Saints. However, Seattle would go on to lose 35–24 in the divisional playoffs against the Chicago Bears. Hasselbeck still played well, however, with over 250 yards passing and three touchdowns. Hasselbeck’s 11 postseason starts as a quarterback rank 16th all-time in NFL history, leading the Seahawks to five postseasons in a row under Mike Holmgren at one point. In 2003, his first playoff appearance, Hasselbeck pronounced, "we want the ball and we're going to score" at the coin flip of overtime with Green Bay. Hasselbeck was intercepted by Al Harris in overtime, who returned the pass for a game-winning touchdown. After that season, Hasselbeck would go on to lead Seattle to six playoff appearances in eight years. In 2005, Hasselbeck led Seattle to Super Bowl XL, where they lost to Pittsburgh in a game remembered for its poor officiating. The NFL Network called it one of the 10 most controversial games in NFL History. Head referee Bill Leavy later apologized to Hasselbeck at a Seahawks offseason practice in 2010, publicly saying he would "go to his grave for kicking several calls in the fourth quarter that affected the outcome of the game." In 2006, Hasselbeck rallied Seattle in the fourth quarter and threw the game-winning touchdown at Qwest Field to beat Dallas Cowboys 21–20, but that occurred before Tony Romo's infamous dropped snap. In 2010, Hasselbeck led Seattle to a surprising playoff upset when he beat the New Orleans Saints, who were the defending NFL champions and 11-point favorites. Although the game would be remembered for Marshawn Lynch's Beast Quake run, Hasselbeck was an integral part in the win with 272 yards and 4 touchdowns. The game was called "Hasselbeck's finest hour" by ESPN, and turned out to be his final game at Qwest Field in Seattle leading Seattle to a 41–36 upset of the New Orleans Saints. Hasselbeck's departure from the Seahawks was largely a surprise, given his status with the Seattle fan base. At the conclusion of the 2010 season Pete Carroll announced re-signing Hasselbeck was the Seahawks "number one offseason priority", with Hasselbeck emphasizing his desire to retire in Seattle. However, the two sides had trouble reaching an agreement as Hasselbeck reportedly turned down a one-year offer before the NFL lockout began, asking for two years. When Hasselbeck was rumored to be "Plan A" for the Tennessee Titans and rumors surfaced the Seahawks were pursuing Tarvaris Jackson instead of Hasselbeck, Seattle fans began a web and social media campaign at the end of the NFL lockout in 2011 to "Bring Back Matt", with a website www.bringbackmatt.com. Pete Carroll and GM John Schneider called Hasselbeck after the lockout to let them know they were "moving on." Hasselbeck described the call as "worse than breaking up with an old girlfriend." The Seahawks took out a full-page ad in The Seattle Times the following day to salute Hasselbeck and his family for their work. Hasselbeck was the last remaining Seahawk from the team's last season in the AFC West Division in 2001. Hasselbeck with U.S. soldiers prior to kickoff at a game in November 2011. On July 29, 2011, Hasselbeck signed a three-year, $21 million deal to play for the Tennessee Titans. He was recruited by Mike Reinfeldt, the former vice president of football administration for the Seahawks and current executive vice president and the chief operating officer for the Titans, who was part of the team for four of Hasselbeck's five NFC West division championships and Super Bowl appearance. 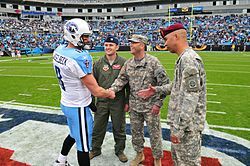 Hasselbeck was targeted by the Titans, who were looking for a veteran quarterback to help lead the team to wins while also mentoring first-round draft pick Jake Locker. The Titans finished 2011 with a 9–7 record, narrowly missing out on the final playoff berth due to losing to the Cincinnati Bengals in Week 9. Hasselbeck's first action in the 2012 season came in Week 1 against the New England Patriots after Locker left early in the game with a shoulder injury. Hasselbeck started the next 4 weeks while Locker healed, finishing 2-2 in those starts; his victories were at home against Pittsburgh (the first Titans win over Pittsburgh since 2008) and at Buffalo, winning on a last-minute touchdown to Nate Washington. The Titans went 6-10 on the season. On March 18, 2013, Hasselbeck was released by the Titans. On March 19, 2013, the Indianapolis Colts signed Hasselbeck to a two-year deal worth up to $7.25 million. He beat Chandler Harnish to win the backup job for the 2013 season. Backing up Andrew Luck, Hasselbeck saw little playing time during his first two years but mentored the budding star. In 2013 Hasselbeck attempted only 12 passes, completing seven for 130 yards and one interception. The following season, Hasselbeck appeared in only four games but led two touchdown drives, one during a blowout loss against the Dallas Cowboys and another during garbage time in the season finale against division rival (and former team) the Tennessee Titans. On February 26, 2015, Hasselbeck signed a one-year contract to remain with the Colts. Hasselbeck made his first start with the Colts on October 4, 2015, filling in for the injured Luck. He led the Colts to an overtime win, defeating the Jacksonville Jaguars, 16–13. After a short week that included Hasselbeck being ill from a bacterial infection and having virtually no practice time, he was once again called upon to play for Luck. He became only the second 40-year-old NFL quarterback to win back-to-back games, when he engineered a 27–20 win over the Houston Texans on October 8, 2015. Over those two starts, he completed 48 of 76 passes for three touchdowns and no turnovers, compiling a 2-0 record as starter. On November 22, 2015, Hasselbeck started his third game for the Colts, as Luck suffered a kidney injury that would ultimately take him out for the remainder of the season. He passed for 213 yards with two TDs and two interceptions in a come-from-behind win over the Atlanta Falcons. The win kept Indianapolis in the lead of the AFC South division and improved them to a 5–5 record. The following week the Colts took on the Tampa Bay Buccaneers, who were on a four-game winning streak. Hasselbeck led the team to a 25–12 win, passing for 315 yards with two touchdowns and no interceptions, which led to a passer rating of 100.8. Hasselbeck led the Colts to a 6-5 record with a 4-0 record as starter at the age of 40, and was the first quarterback in NFL history to do so. However, injuries began to take their toll on the aging quarterback, and Hasselbeck's play would begin to deteriorate as the Colts lost three straight games. Hasselbeck won the final start of his career, an 18-12 win over the Miami Dolphins, thanks in large part to Frank Gore's two rushing touchdowns. Hasselbeck was responsible for five of the Colts' eight wins over the season, despite only starting eight games. On February 28, 2016, it was reported that Hasselbeck would not return to the Colts. On March 9, 2016, Hasselbeck announced his retirement from professional football, and that he would join his brother Tim and become an analyst for ESPN, replacing Mike Ditka on Sunday NFL Countdown. Hasselbeck signed a one-day contract with the Seattle Seahawks to officially retire as part of their organization. Hasselbeck married his college sweetheart, Sarah Egnaczyk, on June 17, 2000. They met at age 17. Sarah was an athlete at Boston College, playing with the field hockey team. Together they have two daughters, Annabelle (2002) and Mallory (2003), and a son, Henry (2005). Matt Hasselbeck was also struck by lightning twice, the first time being in 1996. Not only has he been hit by lightning, his wife has too. He is the brother-in-law of television personality Elisabeth Hasselbeck, who is married to his younger brother Tim. ^ "News on injury "really good today," Hasselbeck says". The Seattle Times. October 23, 2006. ^ Farnsworth, Clare (March 15, 2013). "Trophy QB". Seahawks.com. Archived from the original on April 5, 2012. Retrieved March 19, 2013. ^ "Saints vs. Seahawks - Game Recap - January 8, 2011 - ESPN". Sports.espn.go.com. January 8, 2011. Retrieved March 19, 2013. ^ Branch, John (January 8, 2011). "Hasselbeck Helps Seahawks Upset Saints". The New York Times. ^ McCauley, Kevin (June 7, 2012). "Green Bay Packers Highlight: 'We Want The Ball And We're Gonna Score'". Acme Packing Company. Retrieved March 19, 2013. ^ "Northwest Progressive Institute Archive: Seahawks doomed by horrible officiating". Nwprogressive.org. February 5, 2006. Retrieved March 19, 2013. ^ "Super Bowl XL referee Bill Leavy admits blowing calls in game". Usatoday.Com. August 7, 2010. Retrieved March 19, 2013. ^ "Crazy win drops in Seattle's lap - NFL - ESPN". Sports.espn.go.com. January 9, 2007. Retrieved March 19, 2013. ^ "Seahawks stun Saints in a classic | ProFootballTalk". Profootballtalk.nbcsports.com. Retrieved March 19, 2013. ^ Sando, Mike. "Victory defining for Hasselbeck, Seahawks - NFC West Blog - ESPN". Espn.go.com. Retrieved March 19, 2013. ^ "Matt Hasselbeck leaving Seattle Seahawks; Tarvaris Jackson agrees to deal, sources say - ESPN". Espn.go.com. July 27, 2011. Retrieved March 19, 2013. ^ Morris, Jimmy (July 25, 2011). "Seattle Seahawks Fans Want Matt Hasselbeck Back". Music City Miracles. Retrieved March 19, 2013. ^ Tim Ryan (July 31, 2011). "Seahawks Take Out Ad to Salute Matt Hasselbeck". The Big Lead. Retrieved March 19, 2013. ^ "Tennessee Titans reach deal with Matt Hasselbeck, source says - ESPN". Espn.go.com. July 27, 2011. Retrieved March 19, 2013. ^ "Matt Hasselbeck signs contract with Indianapolis Colts". NFL.com. Retrieved March 19, 2013. ^ Carpenter, Les (October 16, 2013). "Matt Hasselbeck's mentoring of Colts QB Andrew Luck includes a rigged contest". Yahoo! Sports. Retrieved January 5, 2015. ^ Holder, Stephen (December 31, 2014). "Colts' Hasselbeck 'not considering' retirement". Indianapolis Star. Retrieved January 5, 2015. ^ "Colts Sign QB Matt Hasselbeck To A One-Year Extension". nfltraderumors.com. February 26, 2015. Retrieved February 26, 2015. ^ Keefer, Zak (November 30, 2015). "Hasselbeck wisely guides Colts win". indystar.com. Retrieved December 2, 2015. ^ "Colts' Matt Hasselbeck: Not in team's plans for 2016". cbssports.com. February 28, 2016. Retrieved March 9, 2016. ^ Rosenthal, Gregg (March 9, 2016). "Matt Hasselbeck announces his retirement". NFL.com. Retrieved March 9, 2016. ^ Manza Young, Shalise (March 9, 2016). "Matt Hasselbeck retires, will replace Mike Ditka on ESPN". sports.yahoo.com. Retrieved March 9, 2016. ^ Bouda, Nate (March 9, 2016). "Matt Hasselbeck Retires To Join ESPN, Signing One-Day Contract With Seahawks". NFL Trade Rumors. Retrieved May 28, 2018. ^ "Most games started at quarterback". pro-football-reference.com. Retrieved November 24, 2015. ^ "Most wins at quarterback, season". pro-football-reference.com. Retrieved November 24, 2015. ^ "Most Passes Attempted, game". pro-football-reference.com. Retrieved January 8, 2016. ^ "Most Passes Completed, game". pro-football-reference.com. Retrieved January 8, 2016. ^ "Most pass completions, career". pro-football-reference.com. Retrieved November 24, 2015. ^ "Most passing yards, career". pro-football-reference.com. Retrieved November 24, 2015. ^ "Most passing touchdowns, game Seahawks". pro-football-reference.com. Retrieved December 4, 2015. ^ "Most Passing Yards, season". pro-football-reference.com. Retrieved January 3, 2016. ^ "Highest completion percentage, career". pro-football-reference.com. Retrieved November 24, 2015. ^ "Lowest percentage passes had intercepted, career". pro-football-reference.com. Retrieved November 24, 2015. ^ "The Amazing Luck of Matt Hasselbeck". Deadspin. Retrieved October 11, 2016. ^ Bishop, Greg. "Hasselbeck Goes Home Again". The Seattle Times. The Seattle Times. Retrieved October 11, 2016. Wikimedia Commons has media related to Matt Hasselbeck.